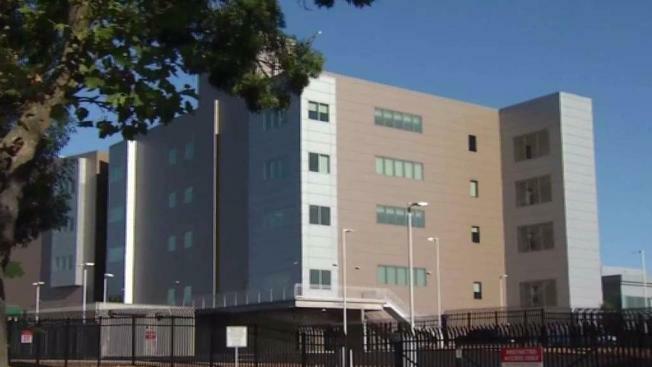 Alameda County Public Defender Brendon Woods on Thursday criticized the plan by the county's top judge to hold all in-custody arraignments of inmates at the county's new courthouse in Dublin instead of having most of them in Oakland, which is the current practice. Speaking at a news conference on the steps of the Rene C. Davidson Courthouse in Oakland, where Superior Court Presiding Judge Morris Jacobson has his office, Woods said Jacobson's plan "is wrong, lacks compassion, is undemocratic and is a step backward." Woods said an arraignment, which is the initial court appearance for defendants, is one of the most significant stages of a criminal case because that's when criminal charges are announced and the court sets bail or chooses to release someone on their own recognizance. Woods said arraignments should take place at a location that is readily accessible to defendants' families because they need to attend in person in order to provide essential information to the court, such as a defendant's community ties and employment. He said having arraignments at the Dublin courthouse, which is 30 miles from Oakland and isn't near a BART station, will make it difficult and expensive for the families of Oakland defendants to make it to court and the result will be that more defendants will remain in custody for longer periods of time, particularly defendants with the lowest income and the least serious charges. Woods said the change, which is slated to happen on July 17, "clearly removes justice from the communities where crimes occur." Woods said he has formed a coalition to oppose Jacobson's plan and is being supported by Oakland Mayor Libby Schaaf, eight members of the Oakland City Council, two state assembly members, Alameda County Supervisor Wilma Chan and 14 community and legal groups, including the American Civil Liberties Union. Woods said that because of the support he's received he thinks "the chances are good" that Jacobson can be convinced to change his mind before the plan is implemented. However, he said he also would consider taking legal action if Jacobson refuses to budge. Joining Woods at the news conference, Oakland City Councilwoman Rebecca Kaplan said, "It's important that everyone have access to the courts but those with the least money will be most harmed by this." Kaplan said, "We need to make clear that we are a community that stands for justice for all." In an interview on Wednesday, Jacobson admitted that the new system "is quite a bit less than perfect" but he believes it will be more efficient than the current system. Jacobson said he must also look at ways of saving money because the county's courts are "in dire financial straits" because their funding has been cut from $125 million a decade ago to only $76 million in the current fiscal year. Jacobson said having arraignments at the Dublin courthouse will be more efficient than having them in Oakland because it's only a block away from the Santa Rita Jail in Dublin, where most of the county's inmates are held. He said the current system of busing inmates from Santa Rita to Oakland is expensive and time-consuming, as inmates are wakened at 4:30 a.m. or earlier, put on buses, brought to Oakland, sit in a courthouse holding facility most of the day, make a brief court appearance and then are brought back to Santa Rita late in the afternoon or early evening. Jacobson said that while it's good if family members can attend defendants' arraignments its not essential in terms of providing information about their community ties and employment because that information is already provided by the court's pretrial services unit. Jacobson noted that after Oakland defendants are arraigned in Dublin, their subsequent court hearings will be held in Oakland so it will still be easy for their family members to attend those hearings.